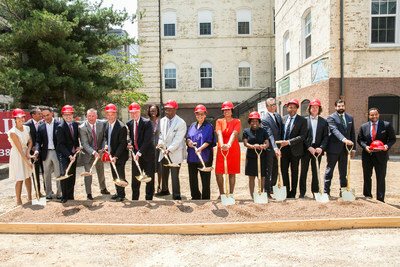 WASHINGTON, June 18, 2018 /PRNewswire/ -- A number of corporate executives and District officials gathered at 2100 L Street, NW to celebrate the start of construction of Stevens School and Stevens Place. Akridge and the District of Columbia (DC) have collaborated for 19 years to establish a plan for the historic Thaddeus Stevens Elementary School and an adjacent parcel of land that was previously the school's playground. As one of DC's first public schools built for the education of African American children, Stevens School has significant importance to the city's history. The developer, a partnership of Akridge, Corporate Office Properties Trust (NYSE: OFC) (COPT), and Argos Group, will renovate the school building, which upon completion, will reopen as a DC public school. Designed by Gary F. Martinez, FAIA of Martinez & Johnson Architecture, the 190,000-square-foot office building will feature multiple facades of floor-to-ceiling glass and a sculptural embellishment designed by renowned artist Jan Hendrix. 2100 L Street boasts efficient, 20,000-square-foot floorplates and a full host of amenities, including a landscaped rooftop terrace and rooftop lounge, penthouse conference center, fitness center, art gallery with outdoor terraces, and more. 2100 L Street will deliver in late 2020. 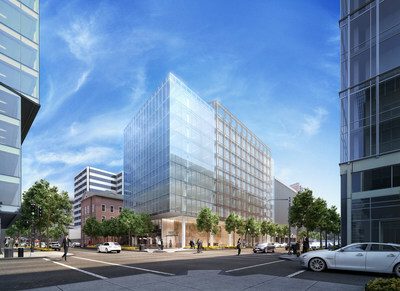 The global law firm, Morrison & Foerster LLP, has preleased 43 percent of the building. The developer worked closely with the District to incorporate several design elements and community outreach that will benefit the surrounding neighborhood. 2100 L Street will honor the Stevens School namesake, Thaddeus Stevens, who was a U.S. Congressman and a strong opponent to slavery. The property will include a rotating art gallery of works from African American artists, as well as a statue outside the building and a feature wall commemorating Thaddeus Stevens. 2100 L Street will provide various community benefits including a college scholarship program for local DC students, as well as a program working with local schools to expose students to real estate development and construction. "With this project, we're delivering on our commitment to expand access to early child care," said Mayor Bowser. "Together, we are giving new life to an important historic landmark, moving forward a long-stalled project, and creating a much-needed resource for our community." "Akridge is proud of its role in the Stevens School and 2100 L Street," said Matt Klein, President of Akridge. "We are eager to strengthen our commitment to the community through both buildings and look forward to delivering a sophisticated and efficient building at 2100 L Street." COPT's President & CEO, Stephen E. Budorick, stated, "We are honored to be an essential member of the team that restores the historic Stevens School to its former greatness, so it can serve the Washington, DC community once again." Akridge is a comprehensive real estate services company that has invested in the Washington Metropolitan area for over four decades. It provides acquisitions, design and construction management, development, finance and asset management, leasing, and property management services. For over forty years, the company has acquired, developed, or entitled more than 18.0 million square feet of office, industrial flex, residential, retail, and entertainment space. Akridge has another 8.9 million square feet in its active pipeline, currently manages approximately 3.1 million square feet, and has a portfolio with an estimated value of over $2.1 billion. Notable projects include the 1-million-square-foot Gallery Place, the internationally recognized Homer Building, and the 3-million-square-foot Burnham Place air rights development project at Union Station. For more information please visit www.akridge.com. COPT is a REIT that owns, manages, leases, develops and selectively acquires office and data center properties in locations that support the United States Government and its contractors, most of whom are engaged in national security, defense and information technology ("IT") related activities servicing what it believes are growing, durable, priority missions ("Defense/IT Locations"). The Company also owns a portfolio of office properties located in select urban/urban-like submarkets in the Greater Washington, DC/Baltimore region with durable Class-A office fundamentals and characteristics ("Regional Office Properties"). As of March 31, 2018, the Company derived 88% of its core portfolio annualized revenue from Defense/IT Locations and 12% from its Regional Office Properties. As of the same date and including six buildings owned through an unconsolidated joint venture, COPT's core portfolio of 157 office and data center shell properties encompassed 17.5 million square feet and was 91.9% leased. As of the same date, the Company also owned one wholesale data center with a critical load of 19.25 megawatts. Argos Group is an innovative real estate developer of residential and commercial properties, providing the highest level of quality, and value to its clients, and investors. Argos specializes in urban-infill, and transit oriented developments, in both private and public-private partnerships. Argos' devoted attention to accuracy and fiduciary responsibility makes us a leader as a hands-on steward of premier public-private development ventures. Argos' experience includes the renovation and adaptive reuse of historic landmarks such as the Engine House, and Police Station in Capitol Hill, and the Montrose in historic Georgetown. For more information, please visit argosg.com. With a professional working relationship spanning three decades, Gary F Martinez FAIA and Thomas E Johnson FAIA founded Martinez + Johnson Architecture (M+J) in 1994, bringing their design sensitivities to institutional and cultural projects in urban locations. Since then, the firm has earned a nationally recognized expertise in the design and planning of world -class performing arts venues and iconic contemporary commercial structures. M+J's design efforts range from cultural centers and libraries, to museums and state-of-the-art workplace environments.Projects such as the Dr. Martin Luther King Jr. Memorial Library and Stevens Place, 2100 L Street NW, both in Washington DC, attest to the success of M+J's operational model as it undertakes and addresses the concerns and needs of its clients and the communities in which they live. Morrison & Foerster ("MoFo") is a leading global law firm whose more than 950 lawyers serve its global client base from 16 offices in the United States, Asia and Europe. MoFo is a leader in a broad range of legal fields, including litigation, financial services, intellectual property and technology, and transactional work, such as corporate, capital markets and real estate finance representations. For more information please visit www.mofo.com.